Friday night we were out with some friends, dinner and karaoke (in case you’re wondering, I *rocked* “Only the Good Die Young.” The entire bar was into it), and then headed back to another couple’s house to chill out. I brought the Wacom tablet because sometimes I just feel like messing with it all day. (I almost skipped karaoke to go draw.) Demonstrating to my friend, I said, “Hey, I’ll paint a picture of you.” The first image I came up with of her was one my husband took on her wedding day a few months back. “You’re really going to paint that?” she asked. The “why not” would probably have been because she was wearing a birdcage veil, and her wife a necklace made of 10 thousand tiny beads. Those would have been reasons not to paint that particular image anyway, because those things were not easy to draw. But I was committed. And it took 3 days. And I did this. So in love ❤ I had a WAY better background and Photoshop crashed as I was saving it! Tried to recreate but it’s so late and it’s not going well. I had fabulous plans for a background, but every time I attempted to execute it looked awful. I’m not 100% satisfied, but I’m not entirely certain how to make the pixels do what I want them to do here, so I’m sticking with this reminiscent-of-the-’80s design for now. The great thing about digital paint is that you can always come back. I can easily put the background in the trash and try a new one. 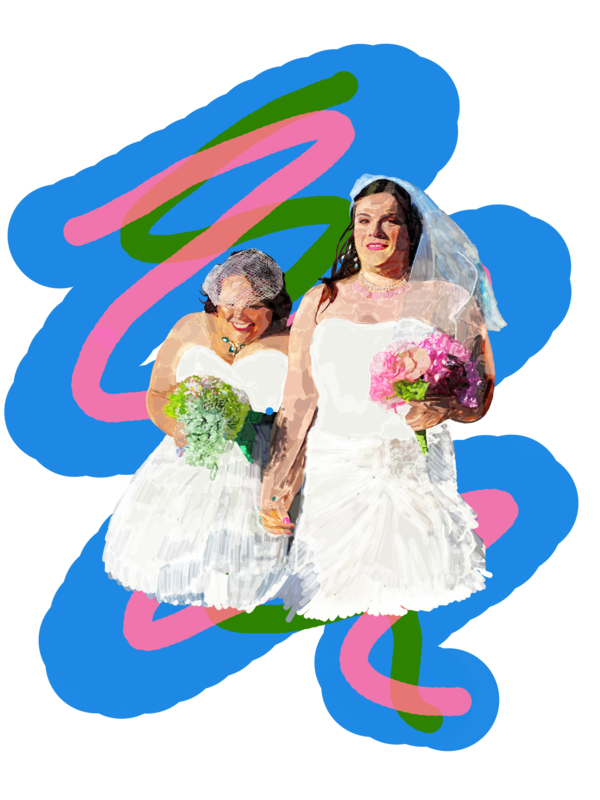 This entry was posted in Digital Paint and tagged art, digital paint, lesbian wedding, lgbt, love, marriage, paint, relationship, wedding on September 1, 2014 by littledragonblue.